On the Ball: The Jets—Time to Plan for 2015? After beating the Steelers 20–13 two weeks ago, Michael Vick and the Jets gave me hope they could salvage the latter half of this season and at least be competitive down the stretch—maybe I was the only one. I remember thinking that all they needed was an upgrade at quarterback and a new weapon in the receiving game (Percy Harvin) and they could compete with anyone. That hope went out the window Monday night as the Jets looked dreadful in a 38–3 loss on a neutral field to a team that barely practiced this week. Since they look like they’ve thrown in the towel for this year, I am too. Let’s look ahead to next season. What do they need to get or change to get back to the playoffs? 1. A good quarterback/passing game. Geno Smith was last among qualifiers in QB rating both last year and this year, before finally being benched. I’m afraid he’s not the answer. Michael Vick was a good quarterback in his prime, but he’s 34 and has been slowed by injuries. He’s clearly a short-term solution and has had some uneven performances with Gang Green. At the same time, he’s probably not as below-average as he’s looked with the Jets, who have never excelled on offense under Rex Ryan. Let’s be honest here, Mark Sanchez has put up some decent numbers this year for the Eagles after four dreadful seasons as the starter for Ryan. His completion percentage is up (62 percent to 55) as well as his yards per attempt (8.1 versus 6.5) and the Eagles have won three of his four games. This was not the Sanchez we knew. Clearly a fair amount of the problem lies somewhere in the coaching staff. We’ll get to that later. As for upgrading the quarterback position, New York is probably not going to be able to trade for an elite one and finding one in free agency is pretty rare. So that leaves the draft. And the Jets, should they keep losing, will have a high pick. Who should they take? While reigning-Heisman winner Jameis Winston is probably the most talented in the collegiate ranks, he comes with considerable baggage. Marcus Mariota has clearly had the better season, though since he stars in Oregon’s high-octane offense, it’s difficult to determine how much of his success would translate to the pros. Either would be an upgrade though. 2. The secondary needs some help. As has been written about over and over again, the Jets were thin at the cornerback position heading into training camp this summer. After a pair of injuries and waiving another player, they’ve been left with the worst pass defense in the NFL in terms of opposing QB rating (a whopping 109.3). Even if the Jets have healthy corners Dee Milliner and Dexter McDougle next season, they need more to beef up the position. Milliner had a good end to his rookie season in 2013, but that’s not enough to count on for 2015, while the third-round pick McDougle has yet to play a snap in the NFL. If Darrelle Revis is available this offseason and the Jets have the cap space available, they should bring him back. 3. The offensive line is lacking. That’s actually putting it mildly. Michael Vick was under pressure all game against Buffalo and that’s been a common theme this whole season. The Jets drafted guards Brian Winters (third round) and Oday Aboushi (fifth) in 2013, but neither has been even adequate. Right guard Willie Colon is on a one-year deal and he has an NFL-high seven false start penalties. Meanwhile, tackle D’Brickashaw Ferguson hasn’t been a Pro Bowler since 2011 and turns 31 next month. Free agent tackle Breno Giacomini has been average, not spectacular. In other words, outside of five-time Pro Bowler Nick Mangold, the line isn’t great and there’s no reason to believe it’ll be better next season unless the Jets are active in free agency and in the draft. 4. What to do with the coach and GM. As mentioned previously, the Jets don’t have a great offensive system right now. Rex Ryan is great at coaching the defense and he also has an amazing playoff record (4–2) especially considering all six games have been on the road. Though the players like him, he’s often slow at benching struggling players—especially on offense. That said, after Monday night’s embarrassing performance, there’s little chance he survives this season. As for GM John Idzik, I’ve gone back and forth about what his fate will be, as well as what it should be. He’s smart to keep ample cap space, but that space should be used if a short-term, low-risk deal comes his way—like Darrelle Revis last offseason. He probably could be forgiven for not using his resources if he had drafted better—but he hasn’t. Although it’s difficult to judge the 2013 class this early (that hasn’t stopped me before), the second-round pick used on Geno Smith was ill-advised from the get-go when he fired his agent after falling out of the first round. With later picks on Winters and Aboushi not working out and an incomplete on the first-rounder Milliner, only fellow-first rounder Sheldon Richardson looks like a good pick. 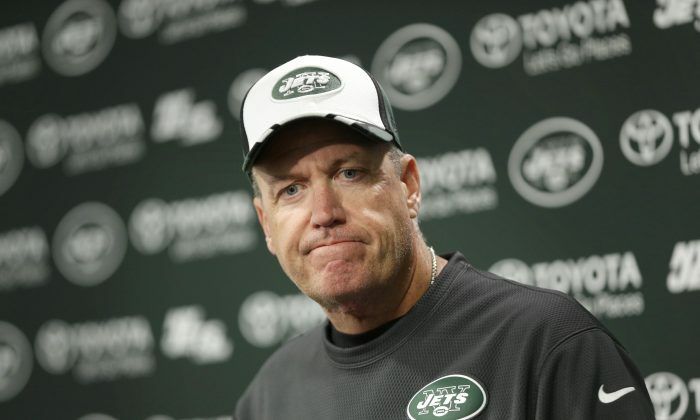 In fairness to Idzik he didn’t hire Ryan, but neither has done a decent job this season. Unless something drastic happens these last five games I can’t imagine the Jets will hold onto either of them.